PamelaQuilts: Two for One...PQ10.3 is a Magnificent Mini! Two for One...PQ10.3 is a Magnificent Mini! 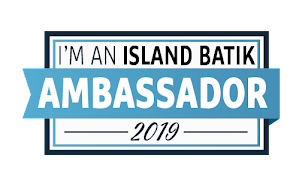 Have to blame this entirely on Kim - she suggested to the Island Batik Ambassador group that our monthly challenge would also suit this week's challenge for Project Quilting...oh yes, a double challenge! 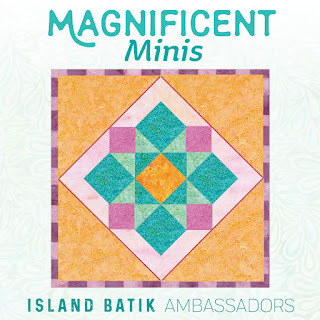 (Fabrics and thread for this project were provided in my Island Batik Ambassador box) With that in mind I set aside my original idea, went to my Miniature Quilt Magazine collection and pulled out an issue at random with the intention of choosing a project for my Magnificent Mini. I quickly found one that suited me, and met both challenge guidelines - Bigger Than a Breadbox (over 9 x 18 inches) and smaller than 24 x 24 for the Island Batik Challenge. Of course I chose a project that required 128 one inch finished half square triangles and 32 two inch finished triangles! That's a lot of cutting! I started out by cutting all the small triangles...so tedious! I did put some Slip Stop onmy Easy Angle Ruler, and that helped keep it from sliding, but it was still a long process to cut sew, and trim all those triangles, even if I only had to trim one side. I decided to get out the Go! cutting system to cut out the 2 inch finished triangles. 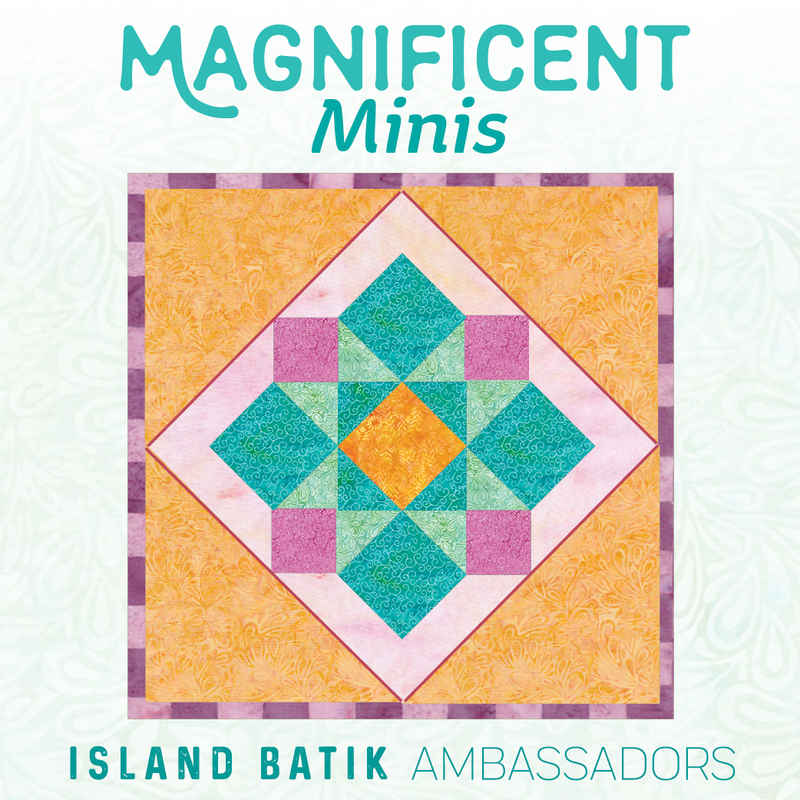 (provided through Accuquilt as part of this years Island Batik Ambassador program) I knew it would be accurate, but I really didn't think it would save me that much time since I was cutting them from sctraps, so would only be doing two matching pairs at a time. Well, I was more than amazed when I realized that I actually cut 32 pairs in about 15 minutes. And really, the waste was not that much, even from scraps. I would have thrown out just as much if I had cut them all with the rotary cutter. Now I really just want to dig in and cut up a bunch of my scraps into useful pieces for quilting. But, wait...I have a challenge to finish first! The pattern is Blues Bayou by Carol J Lewis. It is in the Fall 1993 issue of Miniature Quilts magazine. I got many of mine on e-bay, they are great magazines with lots of patterns! I love the depth that using various backgrounds gives! I made a small dent in my scrap bags with this quilt, and it was fun seeing different fabrics from various projects make an appearance in this quilt. I just love scrap quilts for that reason. 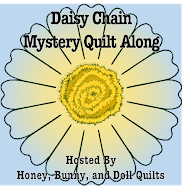 Thanks to Island Batik, Aurifil Thread, Hobbs Batting and Accuquilt! And Kim of Persimmon Dreams for the great challenges! This is so pretty, Pamela! I love all the blues! Super pretty mini and perfect for both challenges. Pretty project! Great colors, and so many triangles! Love the blues and whites. What a darling little mini with lots of movement. Thanks for a chance at your giveaway. That's so pretty! I love blue and cream, and scrappy is fun. although I don't do much scrappy. I am glad you enjoyed using the GO! I would say that it is quite magnificent! Thanks for letting me know about Miniature Quilts magazine. I might look for it. Going for small - I love it! What a lot of work, but it turned out beautifully! All those tiny half square triangles were worth it! Those fabrics are beautiful! Your website looks great. I love the mini. Beautiful colors! I often feel like working with scraps is like visiting with old friends! This is beautiful! I love the scrappiness of it. wow! That's a LOT of triangles! Very impressive for a week's time! AND, two challenges to boot! Pam! This is absolutely incredible! What a beautiful piece and a great way to solve both challenges!